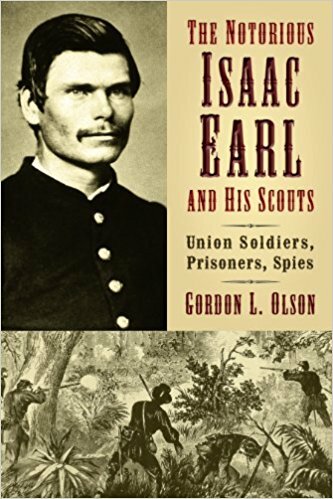 The Confederacy had Mosby’s Rangers, but the Union had Isaac Earl and His Scouts. Isaac Earl was a Wisconsin soldier who led a small group of hand-picked Union troops disrupting Confederate operations and illegal trade along the Mississippi river from New Orleans to Memphis during the latter part of the War. The unit was a Civil War version of our modern-day SWAT Teams. This book tells a story that includes intrigue, espionage, fighting, capture and escape. There’s even romance when Earl marries one of his female informants. The Scouts are equipped with the most modern weapons in the Union arsenal and the fastest horses they could requisition or confiscate. They even had their own steamboat, and the group was so active they wore out three of them during their exploits. Isaac was born in New York State, but as a child moved to Adams County, just north of Wisconsin Dells. When his parents die he lives with his aunt and uncle, and he spends his young adulthood farming the summers and lumbering the winters. He was 20 in April of 1861, when he enlists as a private with Company D, 4th Wisconsin Volunteer Infantry Regiment. The commander of that company was the not-yet famous Joseph Bailey whose dam saved the Unions brown-water fleet during the failed Red River Campaign. Earl’s field savvy and aggressive attitude with the 4th Wisconsin Volunteers during operations around Baton Rouge garners the attention of his leadership. He is captured, and escapes multiple times. In June of 1863 he’s promoted to lieutenant. General Canby, who relieved Nathaniel Banks after the failed Red River Campaign, created this unit and put Isaac Earl in charge of it. Earl’s unit operated outside of the normal chain of command, reporting directly to MG Canby. That status upset some higher ranking officers during joint operations, who at one point, arrest Earl and detain him until Canby intercedes and orders his release. The Scouts were sometimes attached to other units, or given assignments, but they typically operated on their own. 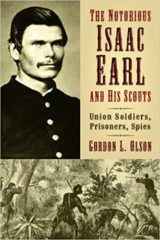 Earl gathers information from pro-union locals, slaves, hired operatives, and even his own Scouts sent out dressed in civilian clothes or Confederate uniforms. Once he got a hard target, he’d plan a raid. Their paddle-wheeler usually left the dock at night, and changed direction once out of sight to misdirect enemy observers. Normally, they would offload at one point, conduct their raid, then rendezvous with their boat at a different landing spot. Earl and his Scouts confiscated over a million dollars’ worth of cotton, wool, currency, boats, horses and mules, boats and steamers. They even captured a shipment from the Confederate Trans-Mississippi Region to Richmond that included not only valuable intelligence information but also all the Union battle flags captured during the failed Red River Campaign. To the units who lost their battle flags, their repatriation was huge. Unfortunately, Earl did not survive the War. Riding point, he’s shot from his horse while passing a hotel shortly after dark in Fayette, Mississippi. Too injured to travel, he’s left with an aide in the hands of a town doctor. The Scouts return the next day with an Army doctor to treat and retrieve Earl but finds Earl and his aide have been taken prisoner and moved behind enemy lines. Earl dies in the hands of the enemy, and is reportedly buried in the graveyard of the Presbyterian Church in Union Church, Mississippi. Isaac Earl was posthumously brevetted to Major in December 1864 for “gallant, meritorious and valuable services”. All too often when we read Wisconsin Civil War history, we gravitate towards Old Abe and the Iron Brigade. There’s a whole lot more history out there waiting to be found. Author Cordon L Olson tells Isaac Earl’s under-told tale in fine fashion in his book. The 4th Wisconsin Infantry is an amazing story in itself. The regiment converted themselves into a ‘mounted infantry’ unit by confiscating horses and tack, and were eventually re-designated a cavalry unit with issued equipment. But that’s a different story for another day.